Where will you be on Thursday, October 18th around 10:18 am? Hopefully, safety tucked away under a desk or table, practicing your “DROP, COVER & HOLD ON” skills. 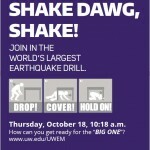 For the 3rd year in a row, on a building-by-building voluntary basis, thousands of UW staff, faculty and students will once again be participating in the nationwide Great ShakeOut drill to educate the public on our earthquake threat and provide tools, skills and resources on how everyone (individuals, families, employees, students….) can be prepared for the day when the “BIG ONE” strikes. As we all know, it is not a matter of IF but WHEN. 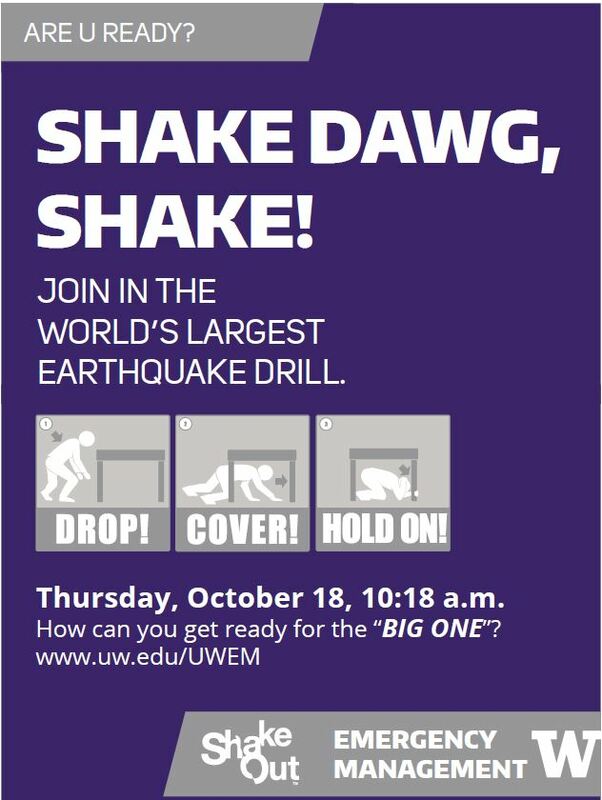 For more information on how to not only survive an earthquake, but also detailed preparedness steps you cant take right now, check out the UW’s earthquake resources page. 55 million people will be getting ready on 10/18/18. Will you be one of them? !